Do You Remember... "Dundee and the Culhane". “Dundee and the Culhane” should be better remembered. Created and produced by Sam Rolfe (1924-1993), best known as writer/producer of “Have Gun Will Travel” and James Stewart’s “The Naked Spur” (‘53), “Dundee and the Culhane” was a 60 minute color western that dramatized the exploits of older, soft-spoken, urbane British attorney Dundee (John Mills) and his young apprentice lawyer nicknamed The Culhane (Sean Garrison) as they traveled the west to aid the cause of justice. It was often fortuitous that the Culhane was handy with a gun. CBS bought the series on the strength of its combined genres—western and lawyer—but quickly lost faith in the show when it underperformed opposite “Run For Your Life” on NBC and movies on ABC. “Dundee…” began airing from 10-11 ET on Wednesdays, September 6, 1967 and ran for only 13 episodes til December 13, ‘67. Too bad. If you weren’t watching in the Fall of ‘67 you missed a good series. It was replaced in December on CBS by a Jonathan Winters Variety hour. John Mills (1908-2005) began acting in ‘32 and won best supporting actor for his role as a mute village idiot in “Ryan’s Daughter” (‘70). 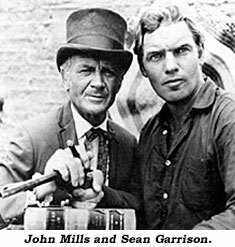 Sean Garrison (1937- ) began acting in ‘58 and was seen on “Cheyenne”, “Colt .45”, “Sugar-foot”, “Big Valley”, “Gunsmoke”, etc. He left acting in ‘77 and formed a swimming pool construction company.